Nicolette Craig explains how mums and dads can encourage the next generation of fishkeepers. If looking for new ways to entertain your children, why not encourage them into fishkeeping? However, it can be tricky to strike a balance between blinding them with your boundless enthusiasm and playing it safe with a single goldfish, but you can stimulate them without having to resort to creating a 'Spongebob Squarepants' style of underwater city tank. In many ways, fish are the ideal first pet. They make no noise, don’t smell, are relatively cheap to feed and there’s no need for kennelling when you go away. They can also teach your children about responsibility, love, life and death. The death of a pet fish is often the first experience a child has of loss and can be an important learning situation. You should also consider that most children are fickle and may lose enthusiasm after the first few weeks, so always be prepared to look after the fish yourself! Be realistic over whether your youngsters are old enough to take the responsibility of cleaning, water testing (using the safer ‘dip tests’) and changes, and feeding the fish. It’s more than likely you will need to take responsibility for some of the jobs! Generally, it’s better to go for a 'relatively' small tank than starting out with a large one, but obviously select one which allows your fish to grow to their full size. A smaller tank with a handful of Zebra danios will be entertaining and educational for your children. 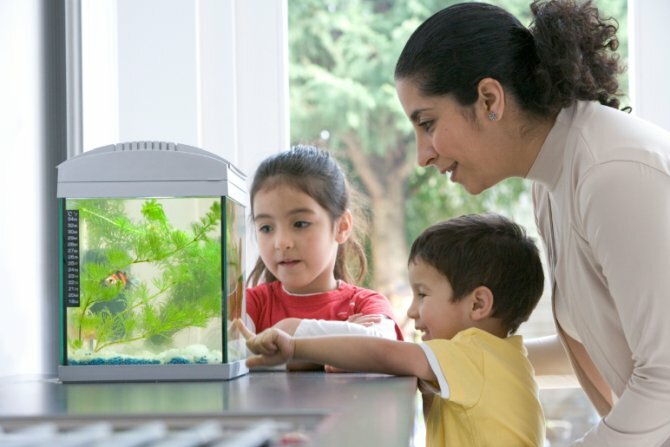 You can teach the basics of fishkeeping, tanks and feeding, and if your child shows boundless enthusiasm you can always progress to a larger tank later on. Most children, if taught early on not to tap on the tank glass, will encourage friends to do the same. Many parents are also worried about safety aspects. Anyone who has a three-year-old might be concerned about the prospect of a tank being pulled over or bashed with a stone or marble. OATA, the Ornamental Aquatic Trade Association, undertakes strict glass and impact tests to determine minimum thicknesses, carrying them out using 5kg rubber balls and 230g steel balls swung from great heights. The glass in tanks is not tempered, so won’t shatter, but you can get thicker than usual glass in tanks. In a small tank they are usually 8mm/0.3”. Consider acrylic. This material is used in most public aquaria, is much lighter than glass and more than 15 times stronger. A 2.5cm/1” thickness is said to to be bulletproof and it can also be polished if scratched. Acrylic tanks can be custom made — or you can buy them off the shelf, like the BiOrb or Fluval Edge. If your children are particularly young consider fitting a lock on the lid to prevent overfeeding or toys being dropped in. Never let your children put their hands in if they have broken skin and ensure any medicines are locked away. What's the best fish to keep? Goldfish aren’t the only fish to consider for a child’s tank. In fact many people find it easier to deal with tropical fish from the start. Fish in a tropical tank are often colourful and can be kept in communities, making them far more entertaining. Marine tanks aren’t impossible, but you would need a very committed child to consider one. Be sensible when selecting fish. Children will undoubtedly be drawn to ‘cool’ fish at the shop, but the novelty of an Oscar or catfish soon fades as it outgrows its tank. Equally, fish like puffers or catfish can be dangerous, having either spines or being poisonous. If going for a community tank ensure all the fish picked are suitable. A good shop will advise you, as a fish which bullies all the others can easily dispirit children. Stocking densities should always be taken into account. Think what you want most from your fish. Neons, Cardinals and other tetras are brightly coloured and active and certainly keep children occupied. Many swear by barbs and danios, and these are fairly hardy if the heating goes off at night. 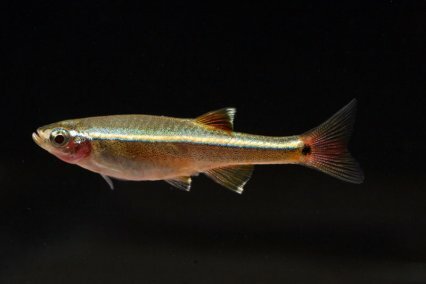 Another species able to tolerate cooler water is the White Cloud Mountain minnow which can also be very active and entertaining. Alternatively, you may see this as an educational opportunity. 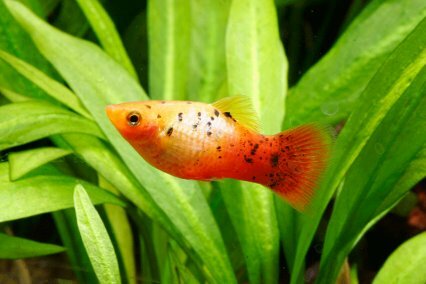 Guppies, mollies, platies and swordtails are all small, cheap, pretty and easy to breed. They are also livebearers, which means that your child could see their fry within a day or so of their birth. If going to breed your fish then a group of six to eight, with two to three females to every male, is perfect. As colour is inherited you can encourage your children to select the parents with the colours they like most. Provide plenty of places, like plants, so the babies can hide and either use gentle filtration or cover the filter with tights so they don’t get drawn into it. Feed the fry on shop-bought fry food and, finally, be aware that these fish breed easily and you may have to invest in another tank for the babies — or find obliging friends/shops to take the youngsters off your hands. With smaller fish either buy specialist foods or use crushed tropical flake. Ensure your child is aware that feeding too much can kill fish and encourage youngsters to only feed them once a day. Ensure they always wash their hands after putting them in any fish tank water. Some fish benefit from not being fed for a day or two. This encourages them to forage and even eat some of the algae which may be in your tank. You can follow this up with lessons in waste and bacteria, so your child understands that too much food can pollute the tank — meaning he or she will understand the need for water changes and testing. Fishkeeping is a fun yet educational hobby for a child. It can bring a parent and child together in a united interest and stimulate lots of conversations and learning opportunities. It’s a lot cheaper than an Xbox too! Accessible electric leads, algae magnets/scrapers/aquascaping tools.Why not take out a subscription to Practical Fishkeeping magazine? See our latest subscription offer.